Categories: I Libyens detentionscentre/english/Danish | Permalink. LEFT TO DEATH IN LIBYAS PRISON? This article is based on almost one year of chats, telephone calls and messages on WhatsApp and Messenger with refugees detained in Libyan prisons and detention centers. Last summer I got to know David from Eritrea through a good friend in Athen and since then, we have had almost daily contact. David spent the last two years in different detention centers in Libya, not knowing when – if ever – he will get out again. Since autumn he has been in Zintan prison, as it seems, the worst of them all, located in the small town Zintan in the Libyan mountains, 150 km from Tripoli. Apart from David there are 800 other refugees and migrants from Eritrea and Somalia in Zintan. Forgotten and desperate, always locked up behind thick walls without access to fresh air and sunshine and very little to eat. Within the last four month thirteen people have died in Zintan Prison, mainly because of tuberculosis. The sick are just left on their own, with no medical help. Left to die among the people still alive. TB is easily spread in the overcrowded prisons and detention center in Libya, and nobody knows, how many are infected. -Today we are out in the sun. We are sitting outside. I did not get any sunshine or fresh air since 15/10 2017. The date 15. of October 2017 David has mentioned for me a thousand times. That was the day when the dream of reaching safety in Europe forever ended. The day, when the soldiers captured him and brought him to one of the many detention centers in Libya. Centers placed in old prisons or big hangars with hundreds of refugees and migrants locked up, mainly due to EUs strict border policy. With hardly any or no access to fresh air, poor food, abuses from brutal Libyan police and guards and left with very little hope ever to get out again. The Libyan police accused David of entering the country illegally. In Eritrea he was working in the airport, until he escaped. His goal was Europe, where most Eritrean refugees obtain asylum because of the inhuman regime in Eritrea. I got in contact with David through a good friend from Eritrea. One day I got a desperate message from Athen, where she and her three children have asylum. Her brother was trapped in a detention center in Libya. Sick and lonely. What can I do, she asked. -We never ever get any sunshine or fresh air and proteins. Only spaghetti cooked in salted water. Always spaghetti. We are hungry. We are freezing. We are suffering. Help us. The messages are often and many, but today David and his inmates have been allowed to go outside. I ask him, if it means that they can go outside every day now? -I don’t know, he replies. After a few days I ask him again. If they are still allowed to go and enjoy the sun? -Ha, ha, no, It was only one day. Now we are locked up in prison again, he writes, followed by a crying emoji. Being a citizen from Eritrea David is registered with UNHCR and officially under their protection. According to international laws he has the right to seek asylum in a safe country, but there is no such procedure in Libya. The country is a so-called failed state, lead by a weak government and different militias, among them ISIS. EU and Italy have made agreements with the Libyan government and the Libyan Coast Guard – and they pay lots of Euro — to keep refugees and migrants away from Europe. The European countries have trained people from the Libyan Coast Guard and paid different equipment so that they will be able to stop more boats reaching Europe. -If they find mine phone, they will arrest me, beat me and sell me for money, David tells me. He is very scared of being sold. CNN has documented, how migrants and refugees are sold on big markets for slaves in Libya. Human Right Watch and Amnesty International have just documented in two reports, how human rights are constantly being violated in the detention centers in Libya. Centers managed by the Libyans, but financed by EU. -This place is hell. They seem to be nice people, but they burn you with electricity. Three times they have beaten me, when they handed out food. They forced us to sit or stand up and look directly into the sun. When we protested, they beat us. They bring people to a particular room and beat them, they took me there, they tied my hands and then they beat me on the soles. A friend of mine got struck the face during beating. Human Right Watch also writes, how the four detentions centers, they are allowed to visit are overcrowded, dirty and without sufficient medical assistance. -We heard about bad and too little food and water in all the centers, it says in the rapport. From friends on Facebook in Libya I hear desperate cry-outs. -Libya is hell on earth. Diseases are in the overcrowded and unhygienic centers: Scabies and tuberculosis. -When people are going to die of TB, they are moved to another room, and we never see them again, David is writing on WhatsApp, his favorite app to write from as it is encrypted and should be secure. -I am also afraid of getting it. People are spitting blood. -Hi Madam, I am from Libya. I am living as a refugee in detention center. What we want from you is to expose the hidden and harsh life, we are passing, always we are locked up, like a prison. Worried I ask him, if it won’t be dangerous for him to inform me about the life in the detention centers. -Do not worry. I will send secretly. The only thing, they can do, is to jail me, and if most of the suffering people get freedom in sacrificing of me, it is a good luck for me, he responds. Noa tells me about the many people infected with TB. -And we all live together. The very sick and the ones who does not know, they are infected and the ones, who are not yet ill. According to my sources only very few get treatment and medicine. And if they do get some medicine it is not followed up, when they run out of the pills. -Everybody is sick here. I want to get away. I will escape as soon as possible, Hassan writes one night in January. When I first got in contact with Hassan, he was hiding somewhere in Tripoli. Now and then he had a job loading cardboard on a truck. The small salary he spend on food. For a while I hear no words from him. Then one day he send me a message from Zintan prison. He has been caught by police, and he too is now in Zintan prison. I do not know how he was caught. There are so many terribly stories. I do not get them all. During the two years David has stayed in Libya, he has been detained in several detention centers, but Zintan is the far worst. According to Noa, UNHCR or other NGO organizations rarely go to Zintan in the mountains, 150 kilometers from Tripoli. The ride is too dangerous. David is very angry with UNHCR. All the registered refugees in Libya feel that UNHCR are letting them down. Where is the UNHCR? They are supposed to protect the refugees, he keeps asking me on Messenger. David’s first detention center was out in the desert. One night ISIS came with a big truck and kidnapped 60 of the detainees, including David and his friends. The ISIS people ordered them on the truck, and when the local Libyan militia arrived, the ISIS people quickly drove into the desert with their load of human beings. While they were driving, three people fell off the truck and were killed. Later a lot of tumultuous happened, and the prisoners succeeded in escaping. After walking for 150 kilometers in the desert they finally ended up in Tripoli. In Tripoli they were arrested by the police and placed in a large hangar along with 1400 other refugees and migrants from Eritrea, Ethiopia and Somalia. I met David first time, when he is in the hangar in Tripoli. The hangar was placed at the airport, and in autumn 2018 a fight broke out between different Libyan militias. -This is dangerous. I am scared. We are all scared. We might die. And he send me photos of bullet holes in the roof of the hangar. Finally they are evacuated. On big trucks they are taken the 150 kilometers from Tripoli to Zintan prison in the mountains. -Now we are in a real prison, David tells me on WhatsApp after several days of silence. Noa sends me videos from the toilets in the detention center, where he is. I feel like vomiting. These are not toilets for human beings. There are six of them for 500 people. -Now we tap our drinking water from a pipe at the toilet. There was another one, but it is broken, and nobody repairs it. There is only running water three hours a day, and I figure out that the lavatories are only washed during these three hours. According to Noa FN’s migrations organization IOM and other ngo’s pay the Libyans money, so that they can fill the tanks with clean water. -But those who receive the money, they only give us water three hours a day. There is nothing we can do. It will not be good to say anything to them. That is the way corruption is, he writes abandoned. One day in December David tells me, how they are freezing. They have no blankets and is still wearing their summer clothes. I ask Noah if they have blankets, where he is. 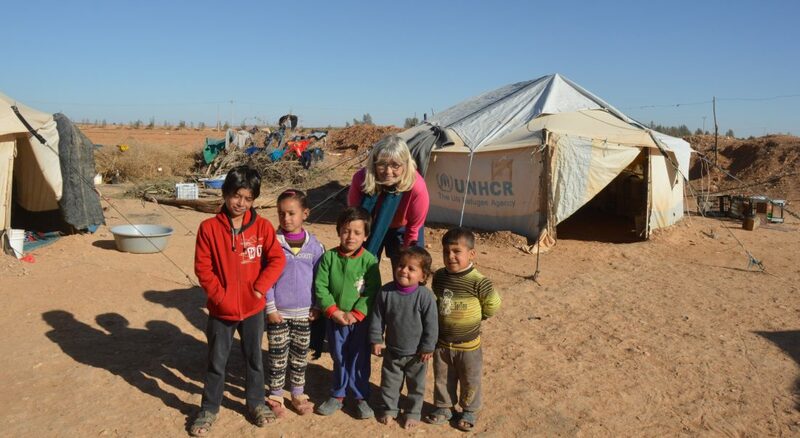 -We have blankets….. Now……We did not have any, but we knew, UNHCR had been there with some. But the guards took them and locked them up in a depot for the purpose of taking them with home. When the war came in August, our guards disappeared, and we broke into the room and took the blankets. This is what happens, when UNHCR does not give the things to us, but to the Libyans. They steel it, he writes. Noah produces another video showing, how they cook. I get it on WhatsApp. A young man is making bread on a pan using a gas burner. In some detention centers the detainees are served one or two spartan meals a day, a piece of bread in the morning and spaghetti in the evening. In other detention centers like where Noa is, the prisoners must pay the food themselves with the help from their families at home to send money. -We have asked, if we can get food, but until now, they say that we have to pay ourselves, he tells me. The boss of the detention center has a small shop, where they can buy flour – to very high prices, but the shop was closed immediately the day, when UNHCR came on one of their rare visits. -Before they arrived, our boss told us, we were just to say positive things. But we were not allowed to say anything at all. During the visit he walked closely to them, and he closed his shop immediately, when they arrived, Noah write on Messenger. According to the report of Human Right Watch EU is paying different NGO organizations in Libya money so that they can improve conditions in the camps. But the organizations are often ineffective and there are a lot of disagreements, even within the UN, the report says. By paying huge amount of euros to Libya EU and Italy have managed to stop most of the human traffic from Libya towards Europe. People though are still fleeing cruel dictators, wars, torture, hunger and no futures, so the number of refugees and migrants in the Libyan detention centers have increased according to Human Right Watch. In July 2018 there were between 8.000 and 10.000 detainees. In April the same year the amount was 5.200. Added to these numbers are the hundreds of thousands who live illegally in Libya, many in the hands of different militias or smuggler groups. -I left Eritrea in 2014. If they send me back to my country, they will put me into prison because of missing. And then they will send me to the military, and I will never get out again. In 2014 he finished as a veterinary, but the regime forced him to work as a school teacher. – I could not accept that. The salary of a teacher in Eritrea is very low. You can not live on these money. One months salary is what a pair of trousers costs. I decided to leave the country, first to Ethiopia, then Sudan and Libya. -I hope to be evacuated. If I can’t, I will have to return to Ethiopia. -We are not OK, Madam. We are hungry. What are we going to do? We can evacuate to Eritrea, but we cannot go back to Eritrea, he writes. Meanwhile Hassan succeeds in fleeing from the prison in Zintan. -When I jumped the wall, the guards discovered me. I ran. They were not able to catch up with me. Then they sent their dogs after me. But even the dogs did not catch me. I am a very fast runner. If the soldiers would catch me…..if you saw, how they beat people. It is better to die. I ran towards a nearby forest. Then I walked for six hours, until I came to a small village, where I found a taxi. And now I am in Tripoli. I am very tired now and will just take a rest. -Three young men from Sudan have set themselves on fire. Here in the detention center where I am. Did you see the video, I posted today on Facebook? Nobody helps them. May Jesus help them, sister. They really need help. -I want to commit suicide. There are no human rights in Libya. I just want to go to a free country and work, but the Libyans have taken my phone and my money. -I don’t know. They have disappeared. Police have arrested a lot of people, she replies. Today early in the morning, at seven o’clock a message on my WhatsApp. From David, written in capital letters: WHERE IS UNHCR? WHERE IS UN? WHERE ARE HUMAN RIGHTS? REFUGEES ARE GOING TO DIE. OPEN YOUR EYES ALL OF YOU. THANKS FOR YOUR SLEEPING. – 800 refugees from Eritrea and Somalia in Zintan are forgotten. They now die of various diseases, most of TB. Right now there are nine dead bodies in the same room as the living people. They ask for an immediate visit from UNHCR and evacuation. David confirms that the nine dead corpses are still there. Within the last four months thirteen people have died. Noah tells me, it is the usual thing with the Libyans just leaving the dead people. -One of my classmates from Eritrea has just died in the prison of Zintan. Of TB. He has been sick for a long time and did not get any medication. I am very angry. -Here in Tripoli we have ambulances. However if you do not go to a hospital, they just leave you to die. The Libyans do not care. In 2018, the number of migrants arriving in Europe fell to 113.482 against 172,301 in 2017. Alle billeder i artiklen har jeg fået lov at låne af Mona Relief Yemen. Website: monareliefye.org., hvor der også står, hvor eventuelle donationer kan sendes til. Ibrahim smøger det ene bukseben op. Under knæet har han en bule på størrelse med et fugleæg. På venstre overarm er et stort rødt mærke. Ibrahim er torturoffer fra Yemen. Hele hans krop bærer mærker efter den tortur, han var udsat i fire måneder. Det er ikke mere end fire uger siden, hans asylbegæring blev godkendt i Grækenland, og nu deler han og fem andre yeminitter en kælderlejlighed i det indre Athen. Lige nu er Ibrahim mest optaget af, hvornår han får sit EU-pas, så han kan komme ud af Grækenland. Officielt giver det blå pas ham lov til at forlade asyllandet i fire måneder ad gangen. Drømmen er Tyskland, Sverige, et hvilket som helst land i EU, hvor han kan få sig et arbejde. Det frustrerer ham frygteligt at gå rundt her i Athen til ingen nytte. Hjemme i Yemen har hans familie ingenting, og allermest mangler de penge til at købe mad for. Oveni det hele har houthierne så også taget hans bror, og familien aner ikke, hvor han er. Formentlig som han selv: Forsvundet i et af deres hemmelige fængsler. Bekymringerne står i kø i Ibrahims hoved under det tæt krøllede sorte hår. Vi har sat os på en bænk på Victoria Square midt i Athen. Ahmet sidder med på bænken. Han er også fra Yemen og vil oversætte fra arabisk til engelsk. Vi sidder lidt i tavshed. Der er en masse afghanere her. Victoria Square er deres samlingssted. Det har pladsen været siden mange hundreder strandede afghanere i marts 2016 slog sig ned her, da Makedonien pludselig lukkede sin grænse, og det ikke længere var muligt at rejse videre op gennem Europa. Kvinder med løstsiddende tørklæder sidder og snakker på bænkene rundt om os. Mænd står i grupper under de forlængst afblomstrede japanske kirsebærtræer og børn leger, de heldigste på et løbehjul. Ibrahim vil gerne fortælle sin historie. Af hensyn til familien hjemme i Yemen under anonymitet. Som yeminitterne er flest, er Ibrahim smilende og venlig. -I thank you from the bottom of my heart, siger han og lægger højre hånd over hjertet for at vise sin taknemmelighed over, at jeg vil skrive om hans folks lidelser. Den glemte krig er krigen i Yemen blevet kaldt. Det er svært at få informationer ud af det lukkede land. Kun få journalister får lov at komme ind, og det lykkes ikke mange yeminitter at flygte ud. Hvis krigen fortsætter, er 13 millioner mennesker i fare for at dø af sult inden for de kommende måneder, advarede FNs landekoordinator i Yemen, Lise Grande fornylig. Den største sultkatastrofe i verden i hundrede år lurer lige om hjørnet, ifølge FN. En koalition af arabiske lande med Saudi Arabien i spidsen og USA, Storbritannien og Frankrig med på sidelinien begyndte i foråret 2015 massivt at bombe Yemen. Samtidig blokerede de landets lufthavne, havne og grænser, så hverken fødevarer, nødhjælp eller medicin kunne komme ind. Formålet var at bringe Yemens internationalt accepterede præsident, Abedrabbo Mansour Hadi tilbage til magten. Hadi har, siden han blev fordrevet fra Yemen af den anden part i krigen Houthierne, været i eksil i Saudi Arabien. Houthierne kontrollerer hovedstaden Sana og de rigt befolkede provinser i nord og vest og er støttet af Iran. Krigen i Yemen er blevet et betændt stormagtsspil, der mest går ud over civilbefolkningen. Ind til nu har krigen kostet mindst 10.000 menneskeliv, måske langt flere. Fornylig bombede Saudi Arabien en bus fyldt med skolebørn. 25 børn blev dræbt. USA og Storbritannien sælger våben til Saudi Arabien. Senest har den amerikanske præsident Trump med henvisning til USA’s handel med saudierne for 1,9 mia dollar af blandt andet militært udstyr kviet sig ved at fordømme Saudi Arabiens drab på den saudiske journalist Jamal Khashoggi på landets konsulat i Istanbul. Og Saudi Arabien, Israel og USA med præsident Trump i spidsen vil gøre alt for at forpurre Irans stormagtsdrømme i Mellemøsten. Imens forværres situationen dag for dag for civilbefolkningen i det i forvejen fattige Yemen. Intellektuelle yeminitter bosiddende i landet beretter på Facebook, hvordan landets valuta totalt er brudt sammen, og hvordan ingen har råd til at købe den mad, der trods alt er på markederne, fordi priserne bare stiger og stiger. I nogle landsbyer har folk ikke andet at spise end blade, forlyder det. Mens skyggerne bliver lange i den lune oktoberaften og Victoria Square fyldes med flere og flere afghanere, fortæller Ibrahim om en anden aften, den 11. Juni 2016 i Yemens hovedstad Sana. Han sidder med sin far, en onkel og sin fem år yngre bror i gården i familiens hus. Det er khadtid. Solen er ved at gå ned, og mændenes venstre kind buler ud af de eufrariserende blade. Jasmintræet sender sin vidunderlige duft ud i natten, og i køkkenet har kvinderne travlt. Deres latter høres ud i gården. Pludselig bliver der hamret hårdt på porten, og der lyder høje råb udenfor. Mændene kikker på hinanden. De frygter det værste. En houti har den sidste tid ringet flere gange til Ibrahims far. Hvis ikke han hver måned betaler en løn til en af deres soldater, vil de komme og hente hans søn. Faren har været henholdende. Ibrahim har sagt nej. De skal ikke lade sig true af de forhadte houtier, mener han. Porten bliver skubbet op, og ind træder fem houtikrigere. -Hvem er Ibrahim? Hvor er Ibrahim, råber den forreste mand aggressivt, mens han løfter sit gevær og skyder op i luften. Tavst rejser Ibrahim sig og går hen mod mændene. -Det er mig. Hvad vil I, spørger han. Mændene griber ham og skubber ham brutalt foran sig ud gennem porten. I køkkenet har kvinderne hørt de høje råb fra gården. De skynder sig at tildække sig og løber ud i gården. Ibrahims mor når lige at få et sidste glimt af sin søn, før porten smækker i bag ham. Så kaster hun sig ned på gårdspladsen og jamrer højt. Ude på vejen venter en bil. En houthikriger sidder ved rattet. Mændene binder Ibrahim for øjnene. Og de binder hans hænder på ryggen og skubber ham op på ladet af bilen. Han kan høre, hvordan flere mænd springer op ved siden af ham. Bilen sætter af med et drøn. De kører længe. Rebene snærer om hans håndled, og det varer ikke længe, før det gør forbandet ondt. Hver gang bilen bremser, bliver han forsvarsløst kastet rundt på ladet, fordi han intet kan se. Efter et par timers kørsel bremser de pludseligt voldsomt op, og Ibrahim tager endnu en rutschetur. Krigerne skubber ham ned fra ladet, og med et hårdt greb fører de ham afsted. Først da de er i et stort rum, fjerner houthierne bindet for Ibrahims øjne. De kaster ham ned på gulvet. Det første han sanser er en masse øjne, der stirrer på ham. Mænd som han selv, hundreder af dem, fanger, liggende og siddende på det hårde stengulv. Væggene i det store rum er nøgne. -Hver gang de torturerede mig, fik jeg bind for øjnene, fortæller han. Det foregik altid i et lille rum ved siden af det store. Hele tiden kunne vi høre skrig fra rummet. De ville have, jeg skulle sige ja til at kæmpe for dem, men det ville jeg ikke. De brugte elektricitet, og de kørte en barberkniv over min krop, og de slog med jernstænger og geværkolber. Både Human Right Watch og Amnesty International har dokumenteret, hvordan begge sidder i krigen i Yemen torturerer deres fanger i hemmelige fængsler. Journalister, læger, advokater, aktivister, studenter og medlemmer af det religiøse Baha’i samfund fængsles vilkårligt, forsvinder og tortureres. Ifølge Human Right Watch har tidligere fængslede berettet om, hvordan Houthi officerer slog dem med jernstænger og trækøller. Og hvordan vagter piskede de fængslede, smed dem mod væggen og truede med at voldtage adem og deres familie. Den amerikanske TV station CNN har dokumenteret, at houthierne bruger børnesoldater, og ifølge nyhedsbureauet AP er amerikanske soldater involveret på regeringens side i afhøringer af fanger i Yemens hemmelige fængsler, hvor tortur også er ganske almindeligt. Ibrahim har ingen fornemmelse af, hvor ofte hans bødler kom og hentede ham. Timerne og dagene flød i et. Det han husker mest var smerten og frygten. Foruden arrene på kroppen er der depressionen og de humørsvingninger, jeg mærker efterhånden, som jeg lærer ham bedre at kende. -De tog alle, der ikke ville slåes for dem. De tager drenge helt ned til tretten år, fortæller Ibrahim. Da jeg sidst snakkede med min far over Skype, havde de lige været i vores hus og hentet min bror. Han er kun atten år. Vendepunktet for Ibrahim kom den dag under torturen, hvor bødlerne brækkede hans ben med en jernstang. Da kunne han ikke længere modstå smerten, og han sagde ja til at kæmpe for dem. -Jeg sagde mest ja for at komme ud af fængslet, forklarer han og ser ned. -Jeg tænkte, at det var min eneste chance for at slippe væk at sige ja. Vi blev kørt ud til en militærlejr i bjergene. De tog mig med, selv om jeg havde brækket benet. Houthierne er ligeglade med alt. Det eneste, de tænker på, er at have deres hænder på et gevær. Kort tid efter de var ankommet til lejren, lykkedes det Ibrahim og et par andre at stikke af. De var heldige. De var velkendte med bjergene. Flugten foregik til fods, men på grund af det brækkede ben måtte hans venner bære ham det meste af vejen. Da de kom ned til en landevej, fik de stoppet en bil, og chaufføren gav dem et lift til byen Ibb et par hundrede kilometer væk. Hele tiden døjede Ibrahim med frygtelige smerter i det brækkede ben, men han turde ikke opsøge et hospital, da houthierne kontrollerede hospitalerne i det område, hvor han var. En dag smed Saudi Arabien så en bombe fra et fly i byen Ibb, tæt på hvor Ibrahim befandt sig. En splint fra bomben borede sig ind i det brækkede ben tæt på bruddet. Nu blev smerterne helt uudholdelige, og hans venner fik ham bragt til en hospitalsklinik i en mindre by. -De healede mig på den gammeldags måde med to stykker træ, som de surrede fast på benet med et reb, fortæller Ibrahim. Saudi Arabiens blokade betyder blandt andet, at det er tæt på umuligt at skaffe medicin i visse dele af Yemen. Træstykkerne måtte han have på i halvanden måned. I al den tid kunne han ikke bevæge benet overhovedet. -Jeg havde to beslutninger. Hvis jeg blev i Yemen, ville jeg dø. Houthierne ville finde mig og dræbe mig, fordi jeg var stukket af. Og jeg ville ikke dø. Hvis jeg gik med dem og sloges med dem, ville jeg være kriminel, så jeg havde ikke andet valg end at flygte ud af Yemen, siger Ibrahim om den flugt, der nu fulgte. Det er meget svært for yeminitterne at komme ud af landet, fordi koalitionen med Saudi Arabien i spidsen har blokeret Yemens lufthavne, havne og grænser. -Min eneste mulighed var at komme til Oman og så derfra til Iran, men vi kan ikke få et visa til Oman, og vi må derfor kun være i landet i tolv timer, fortæller Ibrahim om den nu forestående besværlige og farlig flugt. Ibrahim er stadig sammen med de venner, han flygtede med fra houthierne militærlejr oppe i bjergene. De skal også ud af Yemen. Sammen finder de en taxa, der vil køre dem de små tredive kilometer tæt på grænsen til Oman. -Der boede vi i et telt ude i ørkenen hos en kameldriver i fire måneder. Jeg havde stadig kæppene på det brækkede ben, og det gjorde stadig frygtelig ondt. Imens de boede i ørkenen, fik Ibrahims far skaffet 3000 dollars til flybilletten til Iran, og så han kunne betale menneskesmuglerne videre til Europa. Så snart Ibrahim havde pengene, fløj han til Iran. -Det var dårligt, fordi det er iran, der ødelægger mit land. Og så tager jeg bare til deres land, mener han. -Det tog en måned at komme over, fordi vi måtte prøve mange gange. Hver gang der blev skudt efter os, måtte vi tilbage til smuglernes hus, fortæller Ibrahim. Den nat det endelig lykkedes, vandrede de i bjerge i femten timer, før de endelig var i Tyrkiet. Fra Tyrkiet tog han en smuglerbåd til den græske ø Lesbos, og nu er han så her i Athen. -Jeg troede virkelig, at når jeg kom til Europa, ville jeg få et normalt liv og et arbejde, siger Ibrahim skuffet. Indimellem er Ibrahim så deprimeret, at han bare vil tage tilbage til Yemen, også selv om han ved, det vil være lig med den visse død. In a Libya detentionscenter: Are we going to die here? Desperate messages on Messenger and WhatsApp. -Help us. Help us. What will happen to us? The messages are from one of Libya’s many overcrowded detention centres in Tripoli. A couple of month ago a friend of mine in Athen contacted me. She was very worried, because it had come to her knowledge that her brother was in a Libyan detentioncenter, and thet he was seriously ill. I got into contact with some of his inmates, who spoke English. Because of security I can not bring any names or pictures, but this is some of our conversation. 1400 people stopped into a large hangar. Only light they have seen for month is the artificial from neon tube in the hangars roof. Never any sun or a bit of fresh air. -We are all sick. We lack the sun and air, one message says on my phone. The food is poor and very little in the detentioncentre in Libya. There are days when they get nothing. On lucky days they get a bowl of beans for sharing between six men, in the morning maybe a loaf of bread. Drinking water is dirty. According to an article in the Irish Times, families have to send money for food for the intern, otherwise they will have nothing. The few toilets and showers in the hangar are filthy. Toilets often stopped. Tuberculosis spreads rapidly in the overcrowded hangar, but there is no medical treatment. -We cannot deal with that here in Libya, the doctor says according to my source. The very sick are moved to another room to die. Pictures on my WhatsApp: A lot of people lie or sit in a big room. They have to sleep in shifts because of lack of space. Photos of such thin people that it evokes reminiscences of images from the concentration camps during the Second World War. Pictures of injured people. Large open wounds and filthy home-cooked dressings. I am thinking of the kind of untreated inflammation that I once experienced during a journey far out in the bush in Africa. Inflammation so bad that you die. There are pictures of stopped toilets and flooded showers. And a video of Libyan guards throwing tear gas into the hangar against the many people, who are unable to get away. I also hear the shots. One day the fans in the ceiling do not work. Outside there are almost forty degrees. You want to see how hot here is? On my phones video camera I see a lot of sweaty brown bodies. Sometimes there are battles around the hangar. Libyan militias fighting against each other. -It is fierce war here. We are afraid. Long break, then a new message. -Constantly shooting and there are big tanks with petrol right next to our hangar. I receive pictures of bullet holes in the ceiling of the hangar. And then they are moved. To a village far away out in the desert. The messages are fewer. -We are in prison now, one of my sources tells me and the connection is interrupted. I am thinking how a lot of people just might be forgotten there out in the wilderness. It is EU policy. They can just quietly die out there in the desert of Libya. People who have fleed war and cruel dictaktors. Fleed prison and torture in their own country. They are not criminals. In Europe refugees from Eritrea get asyleum – if they manage to get to Europe. Now they can die in a prison in Libya. Thousands has been sitting for many months in various prisons and detention centres in Libya. The hope of ever being evacuated out of the so-called failed state dies slowly. Therefore they cry for help. Do not forget us. We are human beings too. They shout out. Every day I can hear it. When the messages arrive. It is all EU policy. To prevent refugees and migrants from setting out against Europe in rickety boats, we made an agreement with Libya. We pay lots of money to the deeply corrupt Libyan coast guard so that they hold back Africans. I think European officials have been in Libya to show them how to catch desperate Africans. Instead they are put in Libyan detention centres. Without the prospect of ever escaping. If they are not sold on a Libyan slave market as documented by the American tv station CNN, and as my sources in the detention centre fear most. They even know what the price of a slave like themselves are sold for on the slavemarket there. Many of the financial migrants are returned to the country from which they came. But these who fled of political reasons, they can not just go back to their country. The Eritrean refugees are under protection of UNHCR. As evidence of UNHCR protection, I see images of paper patches with an UNHCR number quickly written with ballpoint pen. Now you are a protected refugee. You are under our protection, the number says. -But where are UNHCR? We never see them, a message says. UNHCR’s work in Libya IS difficult. One morning the Libyan guards leaves the hangar with 140 of the interned. They are put on a truck, and driven away. In the evening they are back in the hangar, a source write in a message. A UNHCR staff working in Copenhagen tells me that it is almost impossible to evacuate people, even the most vulnerable, women and children. At the airport, the Libyans says that the plane will not depart today. Maybe tomorrow or the day after tomorrow. Recently a 28-year-old man from Somalia committed suicide in one of the detention centers. He had just been told by UNHCR, that he had very few chances to be evacuated to a safe country, The Irish Times newspaper writes on the 25. October. On the 17th October the UNHCR send a Tweet saying that 135 particularly vulnerable refugees were evacuated from one of Libya detention centres to a camp in Niger. The evacuees had spent many months in Libya’s Detention centres and was on arrival in Niger malnourished and sick. Yesterday UNHCR in Libya send a Tweet saying that the Libyan coast guard had rescued 100 refugees and migrants of different nationalities from the Mediterranean Sea. UNHCR was in place with food, water, dry clothes and medical care, the Tweet said. And the people were brought to one of the detentionscenters in Tripoli. When will they get out again? Will they ever get out? The political situation does not seem to change – neither in Europe nor in Libya. On the contrary, we are working in Europe and in Denmark for more numbers of such camps. Categories: I Libyens detentionscentre/english/Danish, Ikke kategoriseret | Permalink. Der tikker desperate beskeder ind på min Messenger og WhatsApp. -Help us. Please help us. Hvad skal der ske med os? 1400 mennesker stoppet ind i en stor hangar. Eneste lys, de har set i måneder, er det kunstige fra neonrørene i hangarens tag. Aldrig nogen sol eller en smule frisk luft. -Vi er alle syge. Vi mangler sol og luft, lyder en besked. Maden er sparsom. Der er dage, hvor de intet får. På heldige dage får de en skål bønner til deling mellem seks mand, om morgenen måske et brød. Drikkevandet er snavset. Ifølge en artikel i The Irish Times må familie sende penge til mad til deres pårørende i Libyens interneringslejre, ellers vil de intet få. Hangarens få toiletter og brusebade er uhumske. Toiletterne ofte stoppede. Tuberkulose spreder sig hurtigt i de overfyldte centre, men der er ingen lægebehandling. -Det kan vi ikke behandle her i Libyen, siger lægen blot ifølge min kilde. Når folk er syge nok, flyttes de til et nærliggende rum for at dø. Der tikker billeder ind på WhatsApp: En masse mennesker ligger og sidder oven i hinanden i et stort rum. Hangaren. De sover på skift. Fotos af så tynde mennesker at det vækker mindelser om billeder fra koncentrationslejrene under anden verdenskrig. Billeder af sårede mennesker. Store åbne sår og beskidte hjemmelavede forbindinger. Jeg tænker på den slags ubehandlet betændelse, som jeg engang så under en rejse langt ude i bushen i Afrika. Betændelse så slem at man dør. Der kommer også billeder af stoppede toiletter og oversvømmede baderum. Og en video af libyske vagter, der smider tåregas ind i hangaren mod de mange mennesker, som ingen mulighed har for at komme væk. Jeg kan også høre skud på videoen. En dag virker vifterne i loftet ikke. Uden for er der næsten fyrre grader. -Vil du se, hvor varmt her er? På telefonens videokamera ser jeg en masse svedige brune kroppe. -Det er hård krig det her. Vi er bange. Lang pause. Så ny besked. -De skyder hele tiden, og der står store benzintanke lige ved siden af hangaren – og jeg får tilsendt billeder af skudhuller i hangarens loft. -Vi er i fængsel nu, lyder det og så afbrydes forbindelsen. Jeg tænker på, hvordan en hel masse mennesker stille og roligt vil blive glemt derude i ørkenen. Det er EU politik. De kan få lov at dø i fængslet i landsbyen et sted i Libyens ørken. Mennesker, som blot er flygtet fra et land og et styre, der sætter folk i fængsel og torturerer dem. De har intet kriminelt gjort. I Europa får flygtninge fra Eritrea – de heldige, som når så langt – asyl. Nu er de blot overladt til at dø i et andet fængsel. Det hele er EU politik. For at forhindre flygtninge og migranter i at sætte ud mod Europa i vakkelvorne både har vi indgået en aftale med Libyen. Vi betaler masser af penge til en dybt korrupt libysk kystvagt mod at den til gengæld holder afrikanerne tilbage. Vi har vist endda også været nede og uddanne dem i at fange desperate afrikanere. Istedet sættes de i libyske detentionscentre. Uden udsigt til nogen sinde at slippe ud igen. Hvis de altså ikke sælges på et libysk slavemarked som dokumenteret af den amerikanske tv station CNN, og som mine kilder I detentionscenteret frygter allermest. De ved endda, hvad prisen på et slavemarked er for sådan nogen som dem. Den største fare er, hvis de libyske vagter opdager, at de har en telefon. Kontakten til omverdenen. Mange af de økonomiske migranter kan sendes tilbage til det land, de kom fra. Det kan de, som er flygtet af politiske grunde bare ikke. De, som kommer fra Eritrea, er under beskyttelse af UNHCR. Som bevis på UNHCRs beskyttelse kommer der billeder af papirlapper med UNHCR nummeret hurtigt nedskrevet med kuglepen. -Men hvor er UNHCR? Vi ser dem aldrig, står der i en besked. UNHCR’s arbejde i Libyen ER svært. En morgen forlader de libyske vagter hangaren med 140 af de internerede. De bliver gennet op på ladet af en lastbil, og kørt væk. Om aftenen vender de tilbage. En UNHCR medarbejder i København fortæller mig, at det næsten er umuligt at evakuere folk, selv de mest sårbare, kvinder og børn, som der satses mest på. I lufthavnen siger libyerne, at flyet alligevel ikke afgår i dag. Måske i morgen eller i overmorgen. Igår skrev UNHCR i Libyen på Twitter, at den libyske kystvagt havde reddet 100 flygtninge og migranter af forskellige nationaliteter ude på Middelhavet. UNHCR var på plads med mad, vand, tørt tøj og lægehjælp, lød det i tweetet, – hvorefter de reddede formodentlig er bragt til et af detentionscentrene i Tripoli. Categories: I Libyens detentionscentre/english/Danish | Tags: #Flygtninge velkommen#efugeeswelcome#nærområder, #flygtninge#Kos#Lesbos#næromåder#Jordan#syrien, #refugee crisis#syria#jordan#refugeeswelcome, Flygtninge velkommen, Flygtninge#libyen#detentionscentre#eritrea#flygtningekrise#Libya#refugeeswelcome#detentionscentre#crisis | Permalink. Borgmesteren på den græske ø Lesbos har kaldt øens EU hotspot lejr Moria for Grækenlands Guantanamo. Selv hærdede journalister og nødhjælpsarbejdere kalder forholdene horrible og forfærdende. Når politiet ikke lige er i nærheden, sniger Achmet sig rundt og tager billeder med sin mobiltelefon. Han fotograferer, hvor folk bor. De små farverige festivaltelte i olivenlunden, og de grå tæpper, der skærmende er hængt op i træerne, og som skal gøre det ud for et hjem. Han tager også billeder af mudderet mellem teltene og regnvandet, der løber i strømme allevegne. Han fotograferer de uhumske, stinkende toiletter, affaldet der flyder, plastikflaskerne, foliobakkerne med madrester, det brugte toiletpapir og menneskeekskrementerne. Han tager billeder af pigtråden omkring lejren med vasketøjet, der hænger til tørre, og han er der, da en desperat flygtning står på toppen af et højt tag og truer med at springe ud. Syriske Achmet på 28 år har boet otte måneder i EU hotspot lejren Vial på den græske ø Chios. Med fare for sin egen sikkerhed tog han billeder af de forhold, som selv hærdede journalister og nødhjælpsarbejdere kalder horrible og forfærdende. -Jeg tog ikke billeder af menneskene i teltene. Jeg ville heller ikke selv bryde mig om at blive fotograferet, når jeg boede sådan. Folk har måske familie her i Europa eller i Syrien, og så vil de spørge, hvorfor du bor i et telt, siger Achmet. Han og jeg har sat hinanden stævne på Omonia Square midt i Athen. Achmet har på Messenger foreslået, at vi skal mødes ved det juleoplyste skib midt på pladsen. Han er for en uge siden ankommet til byen fra EU hotspotlejren Vial. Før Vial kom han direkte fra krigen i Syrien og sin belejrede og sønderbombede hjemby Homs. Achmet har mistet sin kone og deres ufødte barn i krigen. De sidste fire år har han levet af brød og ris på grund af belejringen af Homs. Han har levet i skjul. Hver aften et nyt sted, fordi nogen ville slå ham ihjel, og mens han sidder her i Athen, lever hans forældre og familie i kummerlige lejre spredt rundt omkring i Syrien som internt fordrevne. Som Achmet siger: Alle slåes i mit land, Rusland, USA, Tyrkiet, Iran, Saudi Arabien, dem allesammen. Men lige nu gør lysene i Athen Achmet næsten lykkelig. Jeg kan se det i de mørke øjne under den hvide kasket. -Athen er en fantastisk by. Her er så smukt, siger han begejstret. Achmet har de sidste dage sendt live på Facebook. Billeder af bugnende butiksvinduer, markeder, nisser og julehjerter og hvide engle, juletravle grækere, gadesangere og alle tiggerne. Et væld af farver, mennesker, virvar og kaos, lidt lige som hans hjemby Homs før krigen kom. Før vi nu mødes, kendte jeg kun Achmet fra Facebook. Vi blev venner for et stykke tid siden, fordi jeg i foråret 2017 boede tre måneder på Chios. I november begyndte han at lægge billeder ud fra Viallejren. Senere kom der flere billeder taget af en frivillig: En kvinde med en baby på armene, der en tidlig morgen står og varmer sig over et bål. Folk, som har stukket de isnende kolde fødder helt ind i ilden. Plastikflasker brændt i bunden, fordi de er brugt til at varme vand i over et bål i en tønde. En video af en grædende dreng, som standser op et øjeblik, før hans gråd stopper og han går videre, som ved han, at det jo ikke nytter noget. En historie om et par drenge, som forsøger selvmord, fordi nogen større børn har fortalt dem, at det er den eneste måde, de kan komme væk fra lejren på. Og så var der videoen i foråret 2017. En ung mand, som med en lighter og tændvæske i hånden truer med at stikke ild til sig selv stående i den nedlagte fabriksbygning, der er en del af Viallejren. Et par betjente farer på ham, han taber tændvæsken og lighteren, og der går ild i ham. Manden døde et par dage senere af sine forbrændinger. Livet på EUs hotspots ER slemt, så slemt at borgmesteren på øen Lesbos fornylig kaldte Moria lejren på hans ø for: Grækenlands Guantanamo. Da EU i marts 2016 indgik sin kontroversielle aftale med Tyrkiet, blev der oprettet fem EU hotspots lejre til at modtage flygtninge og migranter på de græske øer: En på Lesbos, en på Chios, og Leros, Samos og Kos. De fem øer, der ligger nærmest Tyrkiet, og hvor flygtninge og migranter i flere år er kommet sejlende til i livsfarlige både. Ved aftalens indgåelse lovede EU at sende politi og mandskab til de græske øer, så asylbehandlingen kunne gå hurtigt, men de kom aldrig, eller de folk, som ankom, tog hurtigt hjem igen med den begrundelse, at forholdene i lejrene var for farlige. Ifølge aftalen skulle alle flygtninge og migranter, der ankom efter den 20. marts 2016 sendes tilbage til Tyrkiet – efter en hurtig asylbehandling. Aftalen fokuserede på syrerne og for hver syrer, som blev sendt tilbage, forpligtede EU landene sig til at modtage en syrer fra de tyrkiske flygtningelejre. Til gengæld skulle Tyrkiet stoppe smuglerne og de både, disse satte i havet mod Grækenland. Med i handlen var også, at Tyrkiet skulle have udbetalt tre milliarder euro fra EU til at tage sig af de 3,5 millioner syriske flygtninge i landet, og at tyrkerne kunne rejse visumfrit ind i EU. Alle flygtninge og migranter, der ankom efter den 20. marts 2016 skulle blive ude på de græske øer og ikke komme til fastlandet, så de kunne bevæge sig op gennem Europa. De fem EU hotspots blev hurtigt opfattet som et fængsel af de flygtninge og migranter, som kom til at bo der i månedsvis og år. Aftalen mellem Tyrkiet og EU er aldrig kommet til at virke med det resultat, at der i dag har hobet sig en masse flygtninge og migranter op, både på de græske øer, i det nordlige Grækenland, hvor de kommer ind over land fra Tyrkiet og så i Athen. Dertil kommer, at antallet af ankomne både fra Tyrket til Grækenland af uvisse grunde inden for det sidste halve år er steget med 30 procent. Ifølge officielle tal fra den græske regering og UNHCR var der i begyndelsen af december 2017 15.000 flygtninge og migranter på de græske øer. Alene i november kom der 3.200 nye til. Flest til Lesbos, men Chios tager også en stor del. Hvor der tidligere kom mange afghanere, er det nu mest krigsflygtninge fra Syrien og Irak. 62 procent er kvinder og børn. De mange ankomster har givet overfyldte lejre. I Vial på Chios er der plads til 800, og selvom de græske myndigheder på det seneste har sendt mange til fastlandet, er der hele tiden tre gange så mange, som der er plads til. Det samme gælder for Lesbos og de andre EU hotspots på øerne. De der ikke er plads til i den gamle fabrik, der udgør Viallejren, bor uden for i en nærliggende olivenplantage. Der mangler toilet og badefaciliteter, kloaksystemet er slet ikke udbygget til at rumme så mange mennesker, der er kun koldt vand i hanerne, ingen elektricitet for slet ikke at tale om varme, og sikkerhedsforholdene er overordentlig kritiske med mange slagsmål mellem de forskellige etniske grupper, knivstikkerier – og indimellem overgreb på kvinder. Chios’ faste beboere er vrede. Turisterne svigter, og øernes borgemestre har været i Athen for at protestere. Før jul blev der sendt et antal præfabrikerede beboelsescontainere til øen, men disse er stadig ikke taget i brug. Lokale har blokeret vejen op til lejren. De ønsker ikke Vial udvidet. Den blokerede vej har betydet, at lejrens kemiske toiletter ikke er blevet tømt i lang tid, og at der heller ikke er kørt affald væk. Sundhedsmyndighederne har ifølge den græske avis Ekathimerini advaret mod alvorlig sundhedsfare. I Athen er kontrasten mellem livet i Vial og krigen i Syrien så stor, at Achmet er næsten høj af lykke. Vi har bænket os på en cafe med udsigt over Omonia Square og pladsens lyshav. Achmets engelsk er ikke så godt, men han vil ikke have tolk på. -Jeg vil helst selv, hvis en tolk ikke oversætter rigtigt, hvad jeg siger, skrev han på Messenger, da vi aftalte interviewet. Mens vi sidder i bløde stole og drikker capuchino med flødeskum og kanel, fortæller Achmet, hvorfor han begyndte at tage billeder i lejren og lægge dem på Facebook med fare for sin egen sikkerhed, hvis han blev opdaget. -Ja, hvis politiet opdagede det, ville jeg få problemer. Det ved jeg godt. Men her i Europa er der frihed. De sidste seks år i Syrien har været hårde for mig. Min kone som blev dræbt. Jeg har selv måttet flygte fra sted til sted ude på landet, fordi jeg var truet på livet. Jeg var altid alene, og jeg er meget træt nu, siger Achmet. -Så jeg tog billederne for at vise alle mennesker i verden, hvor slem situationen var for os i Vial. UNHCR er der, og de ved godt, at det er slemt. De gør bare ikke noget. Politiet ved det også. Så jeg tænkte, at måske regeringen i Athen ikke vidste det. Måske ville regeringen også se billederne? Måske ville præsidenten se det? Her i Europa er der jo menneskerettigheder. I krigen i Syrien kan folk uden for ikke vide, hvad Assad gør ved os. Derfor er det vigtigt, at vi sender billeder ud på Facebook fra krigen. Så verden kan se, hvad der foregår. Det er det samme i Vial. Jeg ville have, at alle mennesker i hele verden skulle se, hvordan vi levede. UNHCR er ansvarlig for menneskerettighederne, og jeg tænkte, at præsidenten i Athen kunne sige til dem, at de skulle sørge for, at forholdene var ordentlige for os, siger Achmet. I sommer trak de store NGO organisationer sig væk fra øen. Meningen var, at grækerne selv kunne klare situationen. Det sammen med et stigende antal både har medvirket til det kaos, der er på øerne denne vinter. Mest vred er Achmet på lægerne på det lokale hospital på Chios og så repræsentanterne fra UNHCR i Viallejren. -Der var nogen, som brækkede min næse i Syrien, og jeg har store problemer med at trække vejret. Specialisten på hospitalet sagde bare, at det kunne de ikke hjælpe med, og at jeg kunne tage til et andet land, fortæller han. -UN var heller ikke flinke, og de skal sørge for menneskerettigheder. De sagde, at jeg bare kunne finde mig et arbejde. Men hvordan skulle jeg det? Jeg kommer lige fra krigen og alle problemerne. Jeg kommer ikke fra Dubai eller Paris? Hvordan skulle jeg kunne få et arbejde, når jeg ikke kan sproget? I andre lande lærer man sproget først. I alle lande er der gode og dårlige mennesker, men når man arbejder med flygtninge, skal man behandle dem ordentligt, mener Achmet. Ifølge aftalen mellem Tyrkiet og EU skulle flygtninge og migranter stadig kunne søge asyl, når de kom til Grækenland. Det har medført et internt græsk slagsmål ved diverse retsinstanser, om hvorvidt Tyrkiet er et sikkert land at sende flygtninge tilbage til. Indtil nu er der derfor kun deporteret 2000. Dertil kommer, at mange af de migranter, som aldrig vil kunne opnå asyl i Europa fra lande som blandt andet Algeriet, Marokko og Afrika stille og roligt er forsvundet fra øerne på illegal vis. Enten ved at gemme sig i en lastbil på vej med en færge til Athen. Eller ved at blive sejlet med smuglere til andre øer, og så fortsætte derfra med færgen til Athen. Andre afviste befinder sig stadig i lejrene på øerne på andet år. Achmets store drøm er at komme på universitetet og læse jura. Han har lige fået asyl i Grækenland for en periode på tre år. Som alle andre flygtninge, kan han ikke se, at han har nogen fremtid i i det økonomisk hårdt ramte Grækenland. I juli 2017 lå arbejdsløsheden på 21 procent, og endnu højere for de unge. Nu venter han derfor bare på det pas, der giver ham lov til at rejse frit rundt i hele Schengenområdet. -Jeg vil gerne fortsætte mit liv. Jeg vil bare gerne have et normalt liv, siger Achmet. Og hvad skal jeg her i Grækenland? Der er ikke noget arbejde at få. Jeg vil gerne studere, lære et lands sprog og måske gå på universitetet. Jeg vil gerne i gang med et nyt liv. Finde en kone og få børn. Vi er mødtes igen en uges tid senere, men da er humøret ikke helt så godt længere. Achmet har fået bevilget to måneders psykologbehandling, men der er stadig den brækkede næse og problemerne med at trække vejret, især når han skal sove. Og så er der maven. Han har ondt i maven, og en læge i Athen har henvist ham til scanning på hospitalet, men de ansvarlige i lejren, hvor han bor, bliver ved med at sige: Du skal bare vente. Eller de siger: I morgen, når han spørger, hvornår han kan komme på hospitalet og blive undersøgt. Achmet er ved at opgive. Nu venter han bare på sit Schengenpas, så han kan komme til et andet land. Ifølge de officielle tal er der lige nu godt 50.000 flygtninge og migranter i Grækenland, men tallet er formentlig endnu højere. Folk kommer ikke kun ind i landet via øerne. Mange kommer ind i det nordlige Grækenland gennem smuglerruter fra Tyrkiet. Nye flygtninge og migranter fra nord skal søge asyl via Skype. En forbindelse, der kun er åben en time en gang om ugen, og hvor det er næsten umuligt at komme igennem. Derfor befinder der sig mange uregistrerede flygtninge og migranter i landet. Grækenlands migrationsminister Yiannis Mouzalas har været stærkt kritiseret for sin håndtering af flygtningekrisen og af forholdene på de græske øer. Flere udenlandske medier, deriblandt danske har i vinter været på Lesbos og Chios, hvor det er lykkedes at dokumentere forholdene, selvom det ikke er tilladt for journalister, frivillige eller andre udefra kommende at bevæge sig ind bag lejrenes pigtråd. -Det er meget nemt for embedsmændene i EU at kritisere os. De er hyklere, når de ikke tager deres del af byrden. Vi har en masse mindreårige i Moria lejren, og vi har bedt EU tage deres del af dem, men det nægter de. -Så tænkte jeg på alt det, der var sket i Homs. Jeg troede, at hvis jeg kom til Europa kunne jeg hjælpe mig selv. Eller at UN ville hjælpe. I Vial var der alt for meget tid til at tænke på krigen i Syrien. Man fik lyst til at begå selvmord. Når man har oplevet så mange frygtelige ting, som jeg har, vil man gerne tænke på noget godt. Ikke på noget dårligt, siger han. Vi har indtaget samme plads som sidst på cafeen med udsigt over lysene på Omonia. Jeg spørger ham, om hvorfor han er kommet til Europa, og om han dog ikke på forhånd havde hørt om de umenneskelige forhold på de græske øer. -Det er endnu værre for os syriske flygtninge i Tyrkiet, siger han. -Ved grænsen til Syrien er forholdene rimeligt gode, fordi der kommer de internationale journalister. Men mange andre steder er det forfærdeligt. Mange steder bor flygtninge op og ned af lossepladser, fordi det er der, der er plads. Der vil tyrkerne ikke selv bo. Og syriske flygtninge, jeg selv har snakket med, beretter om tyrkiske mafiagrupper, der gør situationen for syrerne risikabel. De fortæller om, hvordan det er umuligt at få arbejde i Tyrkiet, og at syriske børn helt ned til ti år må arbejde, så familien kan overleve. Boligforholdene er dårlige, og børnene kommer ikke i skole. Ifølge meldinger venter flere tusinde mennesker på vestkysten af Tyrkiet på netop deres chance for at komme til Europa. Generelt er billedet, at de syriske familier ingen chancer ser for at skabe sig et liv i Tyrkiet, og at det har lange udsigter til, at de kan vende tilbage til Syrien. -Der er ingen grund til, at folk i lejrene ikke har adgang til bad, ordentlige toiletforhold og lægehjælp. Det at de ikke har det, siger mig, at det er led i en større plan, der går under navnet afskrækkelse. Lad være med at komme her, for så skal I bo under forfærdelige forhold. -Man kan sige, at der mellem linierne har været flere forskellige tilkendegivelser af, at den uholdbare situation, man skaber på øerne, har en vis afskrækkende effekt for fremtidige flygtninge, før man begiver sig ud. Man tænker sig om to gange, lyder rationalet fra EU systemet. Den holdning fra systemets side har der ikke været så mange officielle pressemeddelelser om, men ifølge Martin Lemberg Petersen har EU kunnet forudse dette. -Man har vist det her på forhånd. Der var en lang stribe humanitære organisationer, der forudsagde dette allerede, inden man lavede Tyrkiets aftalen, siger han. Aldrig før i historien har der været postet så mange penge i en humanitær katastrofe som der siden 2015 er postet i flygtninge- og migrantstrømmen i Grækenland. Ifølge netmediet Refugees Deeply er der brugt ialt 803 amerikanske millioner dollar i Grækenland siden 2015. Heraf har EU postet de 541 ind. Refugees Deeply har regnet ud, at hvis alle pengene er brugt på de 1,03 millioner flygtninge og migranter, som er kommet til Grækenland siden 2015, skulle der være brugt 780 dollar pr flygtning. Siden 2015 har EU, de mange nødhjælpsorganisationer, der opererer i Grækenland og Grækenland selv sloges om ansvaret for, hvor alle pengene er blevet af. -Grækerne beder om hjælp, men de er også lidt fanget i politisk mudder og kviksand, mener Martin Lemberg Petersen. På den ene sidder de mange EU lande, der har det fint med at isolere flygtningene i Grækenland og Italien. På den anden side er grækerne heller ikke et hundrede procent indstillet på at modtage den hjælp, de efterspørger, fordi man er bange for at blive styret eksternt fra EUs side. Tyrkiet har nu officielt 3,5 millioner syriske flygtninge boende. Da Grækenland fornylig gav asyl til en tyrkisk soldat, som cpræsident Erdogan mener er en af dem, som stod bag det mislykkede kup mod ham i 2016, truede præsidenten med at åbne for sluserne og bare lade flygtninge og migranter tage til Grækenland. Grækenlands regering har derfor nu opfordret til, at tilladelsen til asyl for soldaten droppes. -Min oplevelse dernedefra er, at der er rigtig mange flygtninge i Tyrkiet, også i og med at IS belejringen er faldet, siger Martin Lemberg Petersen. -Det jeg hører, og som UNHCR også har været ude at sige, er, at folk som ankommer fra Syrien ind i Tyrkiet mere eller mindre bliver ledt direkte igennem Tyrkiet til vestkysten og derefter så tager turen over til Grækenland. Det kan være med til at forklare, hvad vi har set de sidste måneder. Imens det tilsyneladende sejler for de græske myndigheder, er det godt organiserede frivillige, som står på stranden og tager imod bådene, når de kommer ind fra Tyrkiet. De sørger for varmt og tørt tøj til de drivvåde mennesker, som lige har gjort turen over Aegaerhavet. Det er også frivillige, som for private donationer deler vintertøj ud, og sågar de festivaltelte mange bor i nu i mangel af bedre. Det sidste Achmet sagde til mig, da vi mødtes sidste gang, var, at han gerne ville arbejde som frivillig. Nu fortæller han glad, at han har fået arbejde i Khora Centeret, et sted, der kører på private donationer, og hvor flygtninge og hjemløse blandt andet kan komme og få et gratis måltid mad. -Jeg går ikke, hvor der er en vej. Jeg går, hvor der ingen vej er – og efterlader et spor. Categories: Grækenlands Guantanamo | Permalink. Dette er historien om den syriske kvinde Basimaa og atten dage gamle Mustafa og hans mor og far og 400 andre syriske flygtninge i en iskold squat i Athen. Eneste varmekilde i den nedlagte skole er et lille elektrisk varmeapparat til hver familie, og det går hele tiden ud, fordi skolens gamle elnet er overbelastet. Når Mustafa ikke lige sover, græder han. Lægen siger, at det er, fordi hans mors brystmælk er for kold til hans mave. Af hensyn til flygtningenes sårbarhed og deres sikkerhed er alle de medvirkende anonymiseret, og billederne er neutrale. Hun sidder næsten direkte på det kolde stengulv med kun en tynd madras og et tæppe til at adskille fra gulvets isnende kulde. Håret er dækket af en sort strikhue. Kroppen hyldet i en alt for stor frakke. Foran hende står et lille elektrisk varmeapparat, der tænder og slukker, alt efter om der er strøm. På de udstrakte ben ligger en tæppebylt, som hun hele tiden vugger frem og tilbage. Kulden sniger sig rundt og ind og allevegne. I hjørnerne. Bag ryggen. I kroppen. Og i den mælk hun ammer sin nyfødte med. -Hvis vi nogensinde kommer til Tyskland, er hun nu begyndt at sige og ser trist frem for sig. Hendes søn har kun set sin far på mobiltelefonen. Squat’ en er som Athens andre squats selvkørende. Den får ingen hjælp fra UNHCR eller den græske regering og vil heller ikke have det. De fjorten squats eksisterer på donationer, primært fra frivillige, som rejser til Athen fra hele verden for at hjælpe. Organisationer som Læger uden Grænser, UNHCR, Røde Kors vil man ikke have inden for dørene. Heller ikke selv om Grækenland i år – vinteren 2016/17 har haft det ekstraordinært koldt med temperaturer under frysepunktet og sne. Basimaa har lagt et tæppe ud over det kolde stengulv. I det forhenværende klasseværelse bor nu fire familier med børn og en bedstemor. Skillevæggene er lagner og tæpper hængt op på snore. Sidst jeg var her, havde hver familie et lille iglotelt at sove i, men de var så snavsede, at de måtte smides ud. På etagen oven over bor Basimaa’s kusine med sine to små børn, hvor en er svært handicappet. Kusinen venter også på at komme op til sin mand. Det lille elektriske varmeapparat foran os er en donation. Sådan et har alle familier til at holde den værste kulde fra døren, men skolens forældede elektriske system kan slet ikke bære de mange elapparater. Selvom Basimaa føler sig utryg i squat’en, tør hun heller ikke tage andre steder hen. Hun har prøvet at komme ind i en af de officielle lejre med et godt ry, men politiet afviste hende ved indgangen. Der var ikke plads, sagde de. Så nu holder hun godt fast i sit hjørne i klasseværelset på skolen. Så andre ikke tager pladsen, og hun står hjemløs på gaden med sin søn.